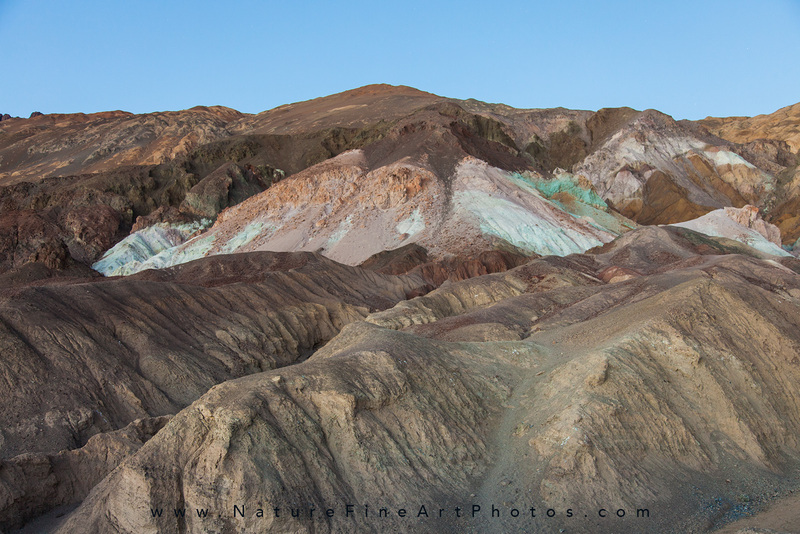 Death Valley National Park has been on my list of magical places to visit for a long time. The time had finally come to book a hotel. Bags are packed and we are eager for another wondrous adventure. I wasn’t sure what to expect. I’ve heard it’s a must see destination. There must be a good reason why millions of acres were saved as a national monument since 1933. 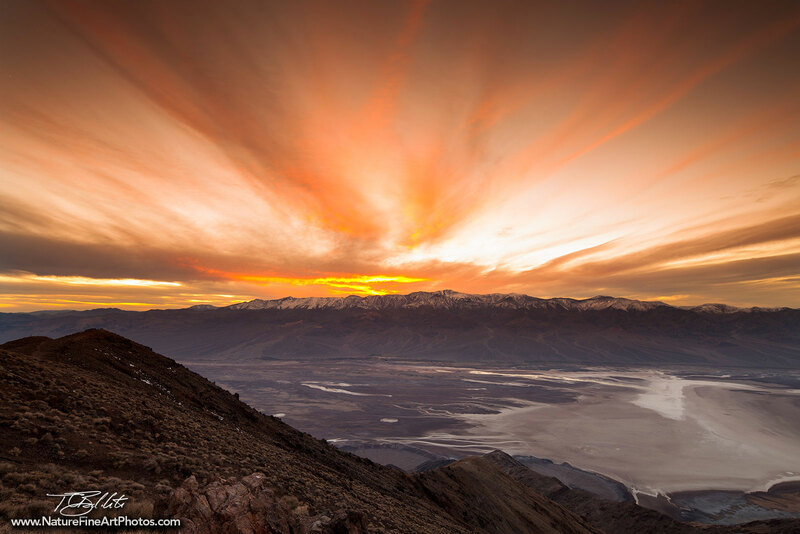 Death Valley only receives 2” of annual rainfall. From the last storm Death Valley received half of their annual precipitation and some of the roads washed out. We had to bypass the entrance from Ridgecrest due to a wash out and enter from Olancha which added many miles and a lot of elevation. 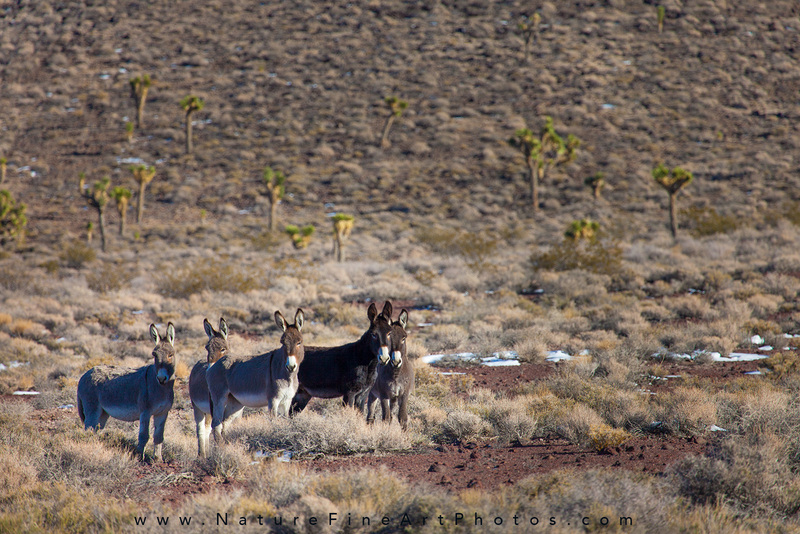 We made it up the mountain and were greeted by a herd of wild burros standing at about 6,500 ft elevation with sprinkles of snow around. This was a pleasant surprise. Heading down into the valley, the road drops thousands of feet quickly. 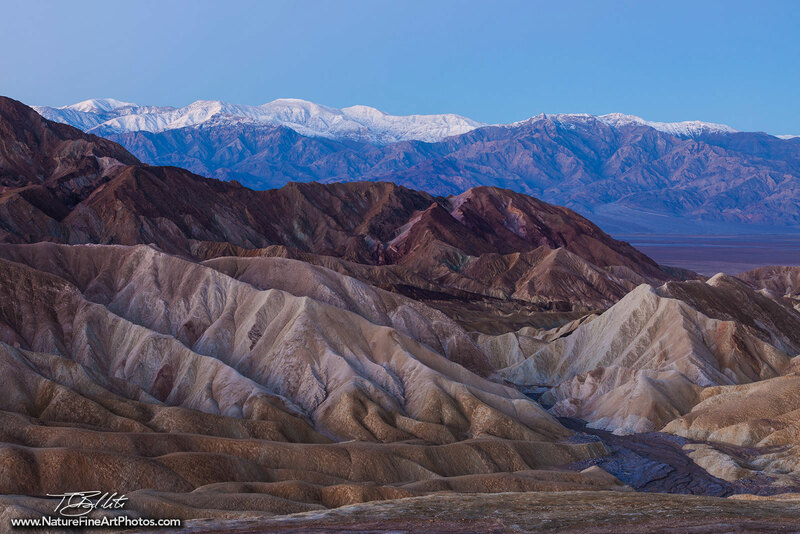 The desert landscape changes quickly in Death Valley from the shrubs and snow at the top of the mountain down into the valley floor to the arid landscape to one of lowest places on earth. The land is suddenly stark lacking trees and shrubs. The valley is a large narrow bowl. The air gets trapped among the mountains, and the hot wind currents are circulated within the high mountain peaks creating temperatures up to 130 degrees. This causes the roads to form wave-like bumps in the road. Our first stop was Mesquite Dunes. These dunes are one of the most visited dunes in the park. They are right off the road near Stovepipe Wells and require little walking to get to them. The sand dunes are constantly changing shape with the prevailing winds moving the sand around. Mesquite Dunes cover a vast area of shadowed ripples, and graceful linear, crescent, and star-shapes. Some people like to walk on the dunes, and others spend time photographing the stark elegant curves. We spent a nice sunset at Mesquite Dunes and it was time to find a place to watch the stars. We ended up driving to an empty parking lot. We laid a blanket down enjoying the cool desert air and the dark sky. It didn’t take long for the stars to show in their glory with numerous shooting stars. It had been a long day and it was time to get some sleep. Driving on the road in the dark was an experience with many coyotes out prowling around. Our adventure today was Zabriskie Point. We walked up a long asphalt path that lead to a vast overlook of erosional landscape in the Amargosa Mountain Range. It contains sediments from Furnace Creek Lake which has been dried for millions of years. This was a very popular place in the summertime. 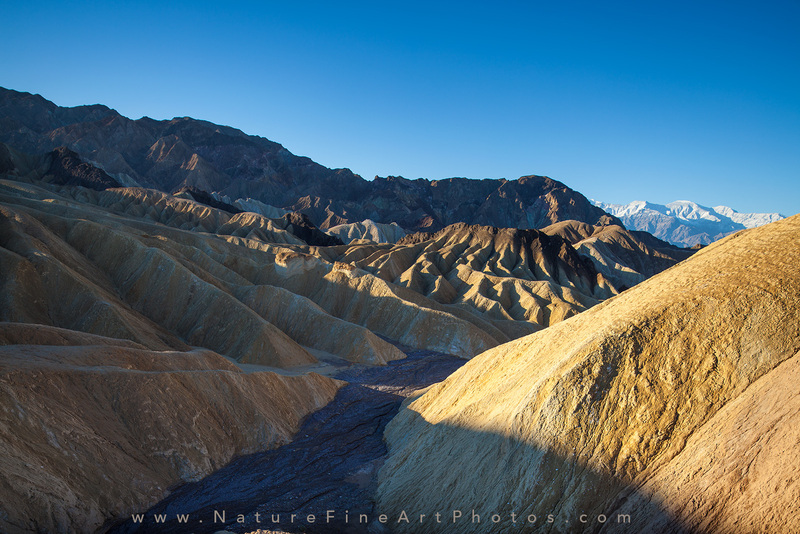 Zabriskie Point is named after Christian Brevoort Zabriskie (1864–1936) manager of the Pacific Coast Borox Company for many years. The Pacific Coast Borox company transported borax from its mining operations in Death Valley. Not to be missed is the Artist’s Drive Scenic Loop. The Loop is a one-way road off of Badwater Road. The surreal landscape of colorful pastels is lightly painted over the Amargosa Range with pinks, greens, and purples hues. The road takes you on a journey through a maze of large dips and tight turns through the iron, mica, and maganese-rich volcanic rocks alongside mural-painted canyon walls. We visited Artist’s Drive at sunset when the sun is hitting the Artist’s Palette. The Artist’s Palette is about half-way on the loop, approximately mile 5. We took this Artist’s drive video at sunset so it’s a little dark. Enjoy the fun and beautiful drive. This morning is Badwater Basin Salt Flats for a peaceful sunrise. The story is told that “Badwater” got it’s name because a traveler was coming through and his mule refused to drink because of the high salt content. Badwater Basin is one of the largest protected salt flats in the world. It covers approximately 200 square miles. The salt flats are quite fragile. The delicate crystals are easily squashed with the thin upper crust that breaks when too much force is applied to it such as footsteps and tire tracks. Badwater Basin Salt Flats is 282 feet below sea level making it the lowest point in North America. 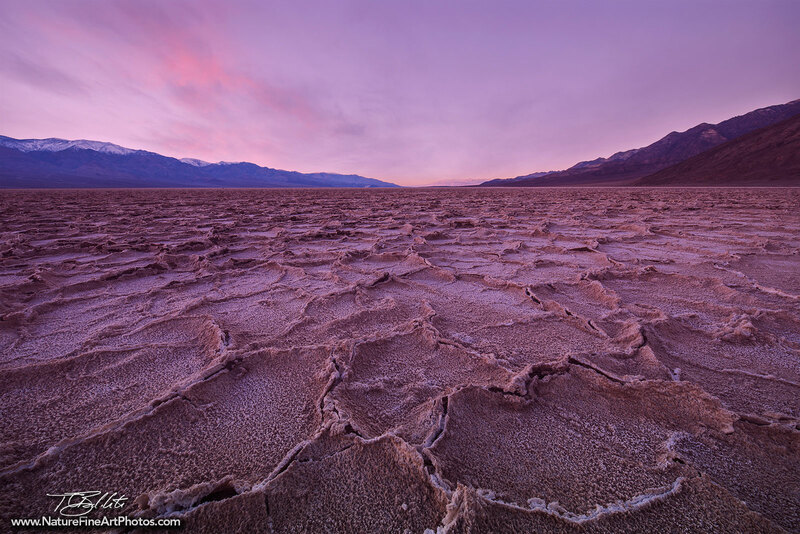 After a rain storm Badwater floods with water forming a lake of standing water filled with minerals dissolved from the rocks and mountains above. Once the water has evaporated, the salt leaves behind layers of salt crust. This is what we see today, years of flooding, salt accumulating and leaving behind hexagonal shapes and patterns of built up salt layers. Dante’s View is our next sunset destination. It sits high above the valley floor at 5,475 feet elevation near the edge of the Black Mountains. The view from Dante’s one can see Southern Death Valley Basin, Owlshead and Funeral Mountains and as far as Mount Whitney on very clear days. Dante’s view was named by a famous writer Dante Alighieri, who wrote Divina Commedia (Divine Comedy). In April 1926, the name was given by a businessmen from the Pacific Coast Borax Company. Dante’s View was also used as a location the 1977’s Star War’s film. We mountain biked up Titus Canyon on the dirt road about 4 miles, biking against traffic on the one-way road. There are toilets and a parking lot a the bottom of the road. With the 250-foot canyon walls along the narrow dirt road, it felt like we were riding through a slot canyon with the cool temperature that stayed trapped in the canyon walls. We enjoyed the temperature for a couple miles until the walls opened up and the desert heat comes through. Titus Canyon Road begins on Highway 374, two miles from park boundary Road near Beatty, Nevada. high clearance vehicles are recommended and 4 x 4’s are preferred. The road climbs up and over 5,000 feet of elevation on a narrow road passing old mines and petroglyphs. The drive can take up to 3 hours to finish the 27-mile drive. It was time to get back on the road. We wanted to bypass going up and over the mountain from Stovetop Wells to Olancha. We heard of a way to bypass the washout and connect us to Ridgecrest. We followed the directions given and we certainly tested out our 4-wheel drive. It was a very sandy road. There was a construction worker nearby who kindly warned us that if my car gets stuck he was not going to help us out. I think he had helped too many people and didn’t get any work done. Either way, we made it and didn’t get stuck. This was another fabulous trip. I was pleasantly surprised by all of the magical un-explainable natural wonders. It’s truly a place one must see for yourself. 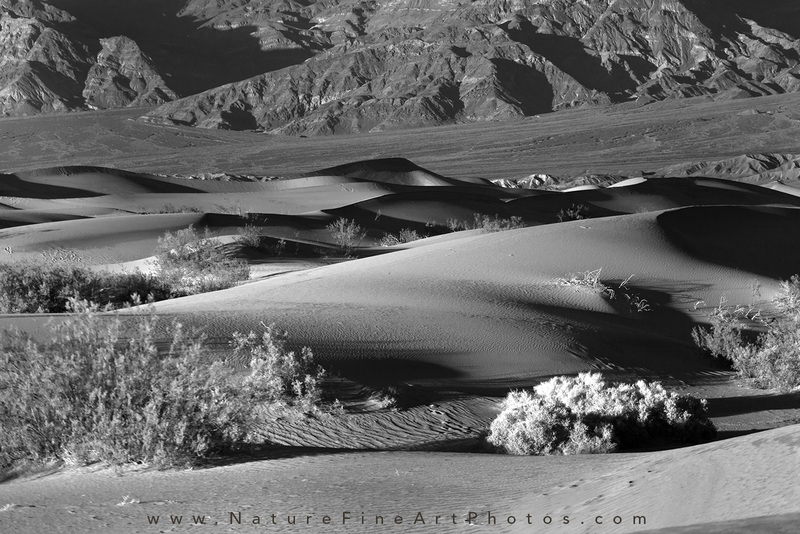 To purchase nature photos of Death Valley please visit the webpage or contact me. Happy travels!